For Memorial Day Weekend 2010 Skate Like A Girl San Francisco and Portland caravanned to the coastal town of Fort Bragg to support the city’s skatepark fundraiser. We made a tour out of the drive up and back from Fort Bragg hitting up skateparks along the way making our way over bridges, through redwoods, along the coast of northern California. Here you’ll find a log of our trip and reviews of things to do. Portland and San Francisco riders met up at Erica and Staycee’s house early Friday morning as we awaited the 7-seatter mini-van. When it was brought back from the airport rental, we loaded up the van with skate clinic gear, boards, backpacks, fruits, and baked goods ranging from savory to sweet thanks to Tanya at Arizmendi Bakery. With a packed van we drove through San Francisco to our first stop at the Potrero del Sol Skatepark in the Potrero Hill area. While at Potrero you should skate up two blocks to 24th Street for great and cheap eateries as well as shops. Stop by Casa Sanchez with you skateboard and you just might get a free soda with your meal. Around noon we left for the Girls Summer Gathering 2 at the Ripon Skatepark across the bay and east of San Francisco. We met up with Lisa Whitaker and Elizabeth Nitu who had arrived for the event.Vanessa Torres came by later that afternoon as well. We skated the park till about 6pm. For food, there’s a shopping center three blocks around the corner with options ranging from pizza, Chinese, and Mexican to a supermarket for all your needs. As the sun was setting, we loaded up the van and car and made our way to Fort Bragg on a five hour drive under the night sky and through the foggy redwoods. We pulled up to the Quality Inn around midnight and settled in for a full a day of skateboarding the next morning. We spent the morning and afternoon helping out with the fundraising event held at the community center. There were raffles, food, an entire street course, and contest divided into age categories. Justin Capri owner of Freedom Skateshop up in Ukiah provided the street course ramps. Skate Like A Girl held clinics with a great turn out. The ladies were practicing even after the clinic till the event ended. Our very own tour rider Yil Sag from Germany placed 3rd overall in the 18-29 category. The Satori team and Nick from Sk8park Atlas were also in town to support the event. The fundraiser ended at 6pm and we spent the evening at the beach before heading downtown to eat dinner. Fort Bragg has a beautiful beach known as the Glass Beach. It’s named this because of all the colorful and smooth sea glass that you will find on the shore. 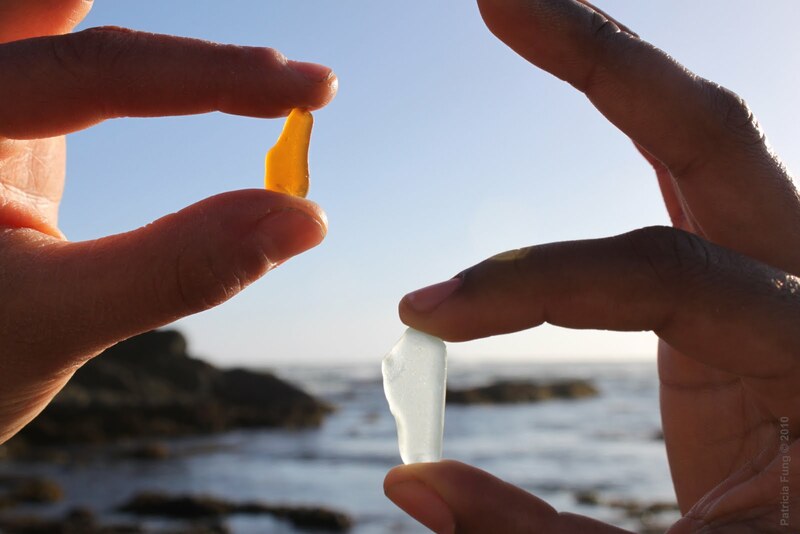 The coastal area was once a dump site, which resulted in all the sea glass that you’ll find on the ground. Be sure to check this attraction out if you are ever in the area. We stopped at Piaci Pizza near downtown for dinner. We easily finished two large pizzas outside of the pizzaria and bar as the sun was going down in front of us. The Genoa (pesto, spinach, caramelized onions, mushrooms, Parmesan cheese, mozzarella, herbs) and Piaci (gorgonzola cheese, pine nuts, mozzarella, tomato sauce, herbs) were both delicious after a long day out. Back on the road again on our last official day on tour. We left around 11 am to skate Willits Skatepark, which is about an hour drive on the way back. Willits is a great park with lots of flow and transition. It can get hot out there so be sure to bring water. Afterwards we continued south to the Sebastopol Skatepark and Community Garden (along the way we stopped for a large tray of fresh strawberries). It’s called the Laguna Skate Garden and it’s definitely got a beautiful landscape in contrast to the dyed concrete. There are many options to skate including a mini bowl, step-up, manual pad, peanut bowl, transition, and ledges. There’s also a restroom in the park and a shaded area to sit under when it gets hot. Around the block is also a Whole Foods if you get hungry. Second to last, we stopped at the older Santa Rosa Skatepark before arriving at a backyard bowl and ramp built by Elraya’s friends. We got to meet a wonderful group of people and skate a great ramp. We left in the evening and arrived home in San Francisco as the Golden Gate Bridge welcomed us back.